Thks a lot for new mancubus! Anyway they are not a standard enemy, they only apear in a few rooms. They are more like a map hazzard, like acid or lava. Then more like red skeletons in castla that can revive themselves…. Haha yes I agree that they behave like zombies and skelies from castlevania. I didn’t realize! But they are still fun. Hope there will be are something like DLC with D64 arachnatrons, more D3 Stuff like chainsaw guys, spiders, wraith, and shield-guys, D4 Baron, etc at future. Yes I also want to make an additional release with more content in the future. Right now the game has 2 maps with 6 levels each. I hope we can make one more map with another 6 levels in the future and get to 6,6,6 haha let’s see how the game goes. Okay. Hope your hardworking wasn’t just waste of time all peoples will say “This game is little but nice!”. 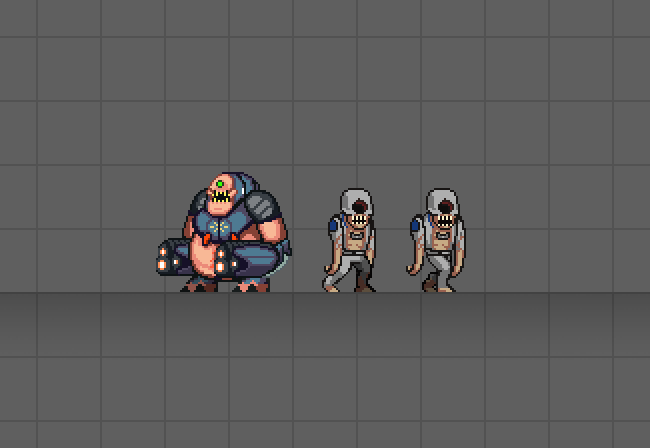 Many my friends skeptical about MiniDoom2 after unpolish first one, but anyway u can do great pixel models…. i have one deal with u in my mind connected with sprites, but DejaVu modification is Hotline Miami stuff and i’m not sure this thing will not die, so better don’t touch u right know (plus i’m not sure how ukrainians can make teamwork with… which nationality are ya?). Ukraine! Wow, we are from Bolivia, almost the other side of the world. I’m not sure I understand your message, I think there was a translation error. Do you want to collaborate in some way? Also, I should give you a special thanks in the game credits, since we actually used your recommendations! Give me your name so we can add you when we make the game credits. Still a lot to do before we get to that though. My name is Vitaliy Pinkovskiy but add that in () symbols and write it after my american analoge of name – William “Makuzman” Byrne (don’t ask me why… long story). P.S. Yup, we noticed that u can make great sprites so i’m with my bro Igor wanna ask u to make for us few sprites because Igor can’t normaly draw faces, but we not sure you can actually work with things we need so… for know just give me you name at Discord pls (mine – Makuzman#0742). If all going to end well we’ll conntact with you. Well good to meet you Vitaliy, my email is [email protected], my other contact information including social media is in the About Us section of the website. Actually my brother makes most of the graphics, I just did the Marine sprites. I’m mostly in charge of programming and game-dev. His contact information is also there. We will surely give you a special thanks for the useful feedback, keep it coming.